Dress up your patio or backyard with this unique, premium quality Indo 9-Piece Rectangular Dining Seating Set featuring a natural finish on reclaimed teak which is both sturdy and stylish. The soft squared back dining chairs are richly woven in a half round woven PE wicker which is weather-resistant and has a natural colour and feel. The Indigo seat cushions are upholstered in waterproof Sunbrella fabric which protects against moisture build up and water es UV resistance for any outdoor use. Malibu 7-Piece Wooden Patio Dining Set with Reclining Chairs in Natural Finish Make way for dinner parties, idle summer cocktails, and the optimization of fresh breezes to come with this Malibu Outdoor Patio 7-piece Wood Dining Set! Made from 100% Eucalyptus - a very durable Hardwood, this set that can stand up to all kinds of changes in the weather. The pores of the Eucalyptus is very dense; thereby it quickly repels water, and its natural oil combats and repels wood eating insects. Comes in the beautiful Natural Wood Finish, this set will be a great addition to your outdoor patio! 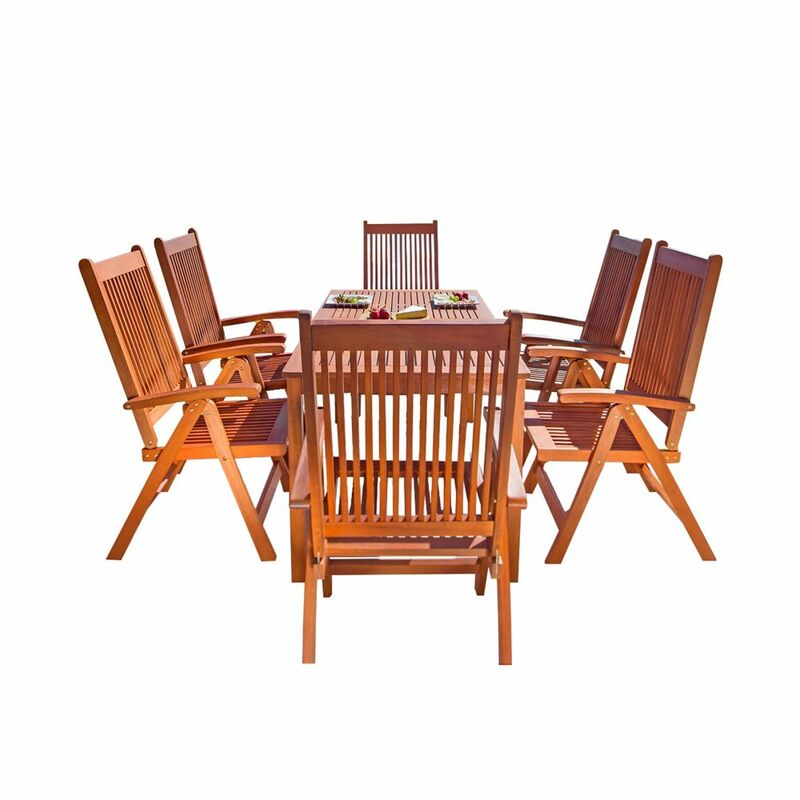 Malibu 7-Piece Wooden Patio Dining Set with Reclining Chairs in Natural Finish is rated 5.0 out of 5 by 1. Rated 5 out of 5 by LoungingLes from Chairs come fully assembled, so all we needed to do... Chairs come fully assembled, so all we needed to do was put the legs on the table. Love the look of this set (clean lines). Seems like quality construction that will last a while too. Chairs don't fully slide under table, but have reclining feature that could be paired with an ottoman for lounging.